You are entitled to be provided with a Personal Travel Plan that will identify the best possible public transport options available from Knights Park to your regular destination. This will be presented in an email format with specific information for you. Refer to the Personal Travel Plan section of this website for more information. The Knights Park development is excellently located to public transport services with bus stops located within a short walk from the site at Tesco’s, just east of Buttercup Avenue for an explanation on how to read the bus timetable, please see below. The nearest bus stops located at Tesco’s food store provides for services into the town centre with onward connections to outlying employment/residential areas, such as in Cambridge via the X5 service. Additional bus services can also be reached at the train station and the Market Square to the north of Knights Park.  The Traveline East Anglia website provides an online journey planning tool for public transport options as well as the ability to search for timetables by stop, street or postcode. Favourite journeys can be saved for later recall. It is also available as a free mobile app for Android and Apple iOS. 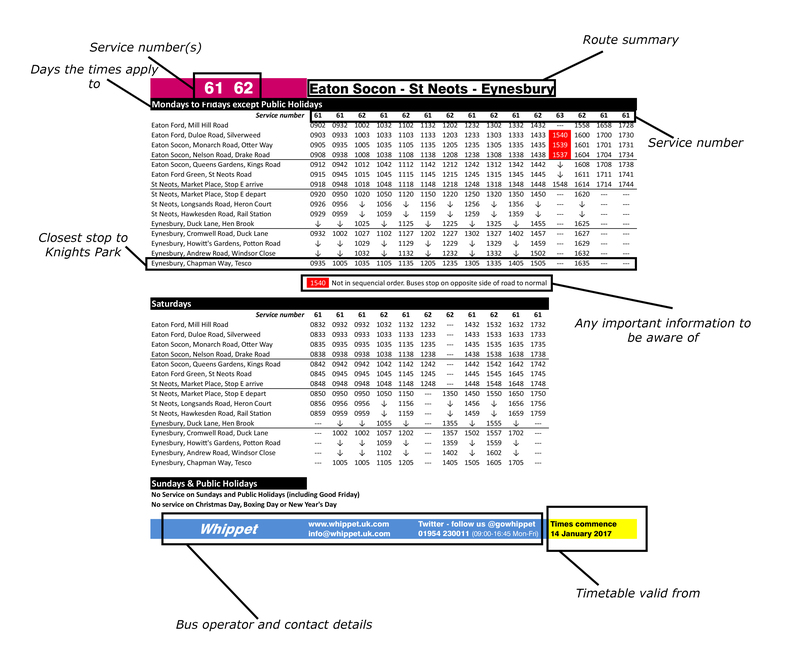 We have put together a small guide on how to download your local bus timetables, and this can be found here. 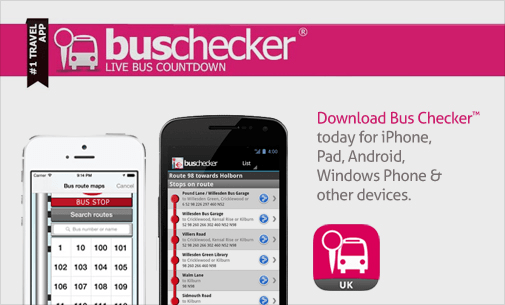 The Bus Checker UK mobile app also provides a useful tool to provide residents with real-time and timetabled services from routes. My Bus Trip app also provides similar services and real-time information on local buses. Stagecoach provides various tickets for travel on their buses locally and countywide and a smart card for regular trips by bus. Further information is available on their website www.stagecoachbus.com. Why not get the Stagecoach Smartcard with no longer a need to carry paper tickets and allows online updating of credit. Please contact your Travel Plan Coordinator for more details. The X5 service (operated by Stagecoach) provides excellent connectivity to Cambridge, requiring less than 40 minutes to reach the city. Services operate on approximately a 30-minute interval. St Neots train station is located approximately 3km to the north of Knights Park, along Station Road. The station is operated by Thameslink /Great Northern Rail with regular daily services to Stevenage, Peterborough, Welwyn Garden City, Finsbury Park (connect with London Underground), and London Kings Cross running every 25 minutes approximately. The station provides sheltered bicycle storage for 84 bikes and 349 car parking spaces for commuters. Car parking for a day is £8.50 which is actually more expensive than getting the bus there and a lot more expensive than getting there by bicycle! The Thameslink / Great Northern website www.thameslinkrailway.com provides details of the services and timetables of services running from the station as well as an online journey planning tool and ability to purchase tickets. Favourite journeys can be saved for later recall and live train tracking is available. There is a version of the Thameslink / Great Northern Railway website optimised for mobile devices and it is also available as a free mobile app for Android and Apple iOS. 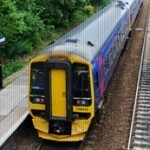 Commuters travelling from St Neots to London, for example, can purchase season tickets at discounted cost and non-commuters can also obtain various rail discounts via railcards (i.e. 16-25s and family and friends). Please refer to the Railcards website located here www.railcard.co.uk for further information and to obtain the railcards. The ‘Plus Bus’ system is also now available in St Neots! This offers you a discounted bus travel when purchasing with a train ticket. The Plus Bus ticket provides you with unlimited travel on buses in the area for the day. A daily adult pass is £3.00 and it’s just £1.50 for a child. Plus Bus tickets can be purchased at St Neots train station or online through their website. Please also note, Plus Bus is available in most large towns and cities!